During June 2010 there were 65 million tweets posted each day, an average of 750 per second. This is small potatoes compared to the 3,085 per second on June 17, just after the LA Lakers defeated the Boston Celtics in game seven of the 2010 NBA Finals. We are all knee-deep and rising in an era where a 140-character message can make national news within seconds after it is posted by Justin Bieber or Sarah Palin. The already short attention span of a nation of incipient ADDs seems to be under ever-new media pressure to tap into our escalating impatience. When I began these weekly essays over a year ago, it was in part a self-administered antidote, my own escape from the relentless and ephemeral clamoring for attention that our media-driven world demands. We bounce casually all day long from topic to topic with the click of a mouse, dispensing judgments and encomiums in a keyboard shorthand that one day will require deciphering (if anyone then cares) by linguists. My own eclectic interests pull me from one subject to the next. But by forcing myself to choose a single topic to write about each week--- to sit, think, research, and write these musings, it allows me to place new experience into a greater context, to ground it, make it part of my life, rather than just deposit another fleeting impression, soon to be shelved aside by yet another impression. In writing these pieces I have found myself becoming deeply attached to the men and women, living and dead, who have created the art about which I write. We Americans, more than most people, live inside our work. Our very identity seems entwined with our work, perhaps for filmmakers even more than most. The hours demanded of us exceeds that of any normal profession; but one of the ancillary rewards we have is the total immersion into the real life or fictional drama that filmmaking affords us. It is something akin to this immersive sensation that I receive each week as I release these essays into cyberspace. Here is another sampling from the year’s archive, some of the essays that have have stayed with me the longest. 1. (12-14 to 12-24) Christmas season last year was bridged by the four-part essay I did on the career of legendary cinematographer Karl Struss. There is no parallel that equals his career. Already highly regarded in his youth as a member of the Alfred Stieglitz circle in NYC, he re-grouped in Hollywood after WWI as a set photographer for C.B. DeMille; he won an Academy Award for cinematography within a decade. Farber had his own violin d’Ingres. He was a damned good painter. 3. (1-11) There has been almost no painter more beloved than Claude Monet. His rigorous exploration of form and light, and of the eroding effects of nature, is no more thoroughly explored in Western art than in his 30 some odd paintings of “Haystacks,” six of which can be seen together at the Art Institute of Chicago. 4. (12-1) It is still hard for me to believe that I actually met the great American classical composer Elliott Carter, born in 1908 (another maverick, like Farber, of the first order), one whose temperament but surely not his music, has mellowed with age. This is a man who as a boy was taken by his father to the American premiere of Stravinsky’s Rite of Spring at Carnegie Hall in 1924. My essay celebrated his 101st birthday, a day on which, like all others, he sat at his desk, composing. His gentle humanism could present no starker contrast to that of the Parisian Surrealists of the 20s and 30s, whose moment in the sun was waning even as Ronis’ was warming. When I was photographing “Country Strong” in Nashville this past winter, the Frist Museum hosted a major exhibition of Paris Surrealist photography that traveled next to the ICP in NYC. I saw it at both venues; the somber yet tasteful display in Nashville lent it an air of dreamy disconnect that reflected tenets of the movement’s manifesto written by Andre Breton. 6. (3-8) When I posted the essay on photographer Frank Hurley and his mission with the ill-fated expedition of Ernest Shakleton in the Antarctic, I had no conception then that I would be standing within a few hundred miles of that continent’s antipode a mere five months later. (In late July, I was in Barrow, Alaska scouting locations for a new film.) The tale of the voyage of the Endurance acquired a new immediacy for me. This is one of the most amazing stories of rescue in all the annals of exploration. Frank Hurley’s images gave it immortality. 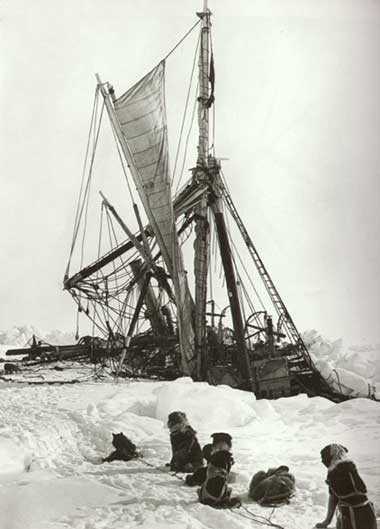 Here is a link to section four of the Endurance documentary, the ice-bound ship crushed even as Frank Hurley photographs it with his Prestwich 35mm camera. The entire documentary is there on YouTube. 7. (2-1) We are well conditioned to accept documentary films and videos as records of the dramatic events around us. The art of painting, however figurative and realistic it may be, is usually consigned (unlike in a pre-photography era) to the realm of aesthetic enjoyment alone. However, German painter Gerhard Richter has sometimes used his canvas and brushes to explore themes of contemporary real life tragedy. A quiet, almost pastoral looking painting of his titled simply September is his meditation on one of the most traumatic events of this still young century. 8. (4-19) An article in New Yorker magazine about high powered water displays led me to consider a brief history of fountains. As I researched and wrote the piece, there were constant felicitous discoveries, including an iconic scene from a Fellini film. Engineering and art merged at the end of the essay in a joyous display, capped by the son, lumiere et eau dance of the Burj Dubai fountain. 9. (12-7) I still am not quite certain why I thought the unlikely juxtaposition of such dissimilar photographers as American Garry Winogrand and Russian Alexey Titarenko would be of interest. In temperament and style the two represent near opposites as artists. Yet the simple fact is that both of them found their inspiration in unpredictable moments, prowling the sidewalks of two great cities. I was also lucky to find compelling documentary footage that followed them, as their camera seemed to take on its own life. I knew Garry Winogrand during his late Los Angeles years, and I am now a close friend with Titarenko and his wife, Nailya Alexander, who has an intimate but ambitious gallery in New York’s Fuller Building. Here is the second part of a documentary about Titarenko. He explains the historical context of his work in St. Petersburg. The blog essay includes the full documentary on both artists. Each one of these weekly essays has allowed me to take time out to focus on subjects that deeply interest me; I hope they will you as well. Admittedly, we all have differing tastes. You may imagine there are not many who care to see the French composer Olivier Messiaen improvise on the great organ of Trinité in Paris. But so far over 88,000 YouTube viewers have. I find it always dangerous to second-guess what may or may not intrigue someone. As filmmakers, our work carries us across many socio-politico-cultural divides and our interests expand in tandem with our careers. We are not office-bound drudges, stuck in an endlessly recurrent environment; we have the surprise of being constantly surprised. What I hope to do as I continue on with these weekly forays is perhaps—to surprise. A good friend who has been a reader since the beginning advised me that it would be better if I concentrated solely on film-related subjects. After all, this blog is hosted by the ASC. Cinema is only the newest of the classical arts, the so-called seventh art, so dubbed by the early film critic Ricciotto Canudo . The cinematographers who I am privileged to deem my own mentors had enduring, passionate interest in all of the arts. I would consider myself fortunate to be even slightly of like mind. There is no agenda for these weekly blogs. Passionate work is the only litmus. I am eager to find new subjects. Please, give me your ideas.